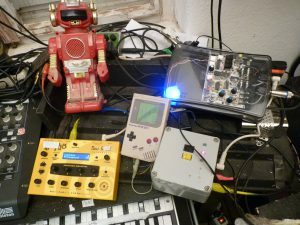 I lately build an Arduinoboy (Gameboy + Arduino + Midi) for our Band “Sonic Robots” and found the information on the net quite dispersive for a 8bit-n00b like me. 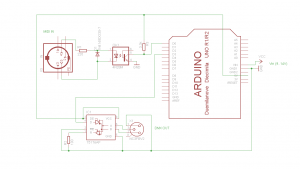 So here’s yet another Arduinoboy tutorial sharing my experience and adding some smaller hacks. Yesterday night I hacked together a quick and dirty Arduino MIDI-to-DMX control . It’s really simple! And here’s how I did it. I have two really cheap LED Par56 from Stairville (DMX controlled), a simple DMX-Dimmer pack and use Ableton Live for our sound setup. So all I want is to control the different colors and dimmer channels (DMX channels) with each one Midi-Note. The pitch (note) shall represent the channel, the midi velocity shall represent the actual DMX-value (brightness). 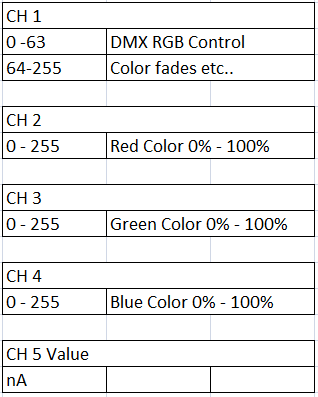 So all we have to do is to send something from “0 to 63” to “channel 1” to set the device to RGB Mode and then the brightness value (0..255) to channel “1..3“ for the brightness of the different colors. Really easy. When you set another start address for the DMX Device, the 5 channels are shifted, e.g. to 7,8,9,10,11. One Note: this circuit does not provide isolation. Be sure to connect all devices and the control to the same electrical loop (Phase). The code is not too nice written, but works as supposed and can be easily adapted. // welcome to MIDI to DMX by moritz Simon geist. // DMX CHANEL 3: 0 .. 255 Control Green   --> .... MIDI Note "2"
// DMX CHANEL 4: 0 .. 255 Control Blue    --> .... MIDI Note "3"
So what we have here is, that we control each of the DMX channels with one note and its velocity. We can for example set red from LED PAR1 to 255 (100%) and blue and green from LEDPAR2 to each 128 (50%). The light will cease when the Midi note-off command is sent. In Ableton I opened up a new Midi track where I can control the lights with notes. What I did to have a hardware master fader: I added a Midi device to control the velocity of all the notes, and midi mapped it to my APC40 midi controller. Like that I additionally have a hardware master fader! When you build the circuit be sure to debug one thing after the other. 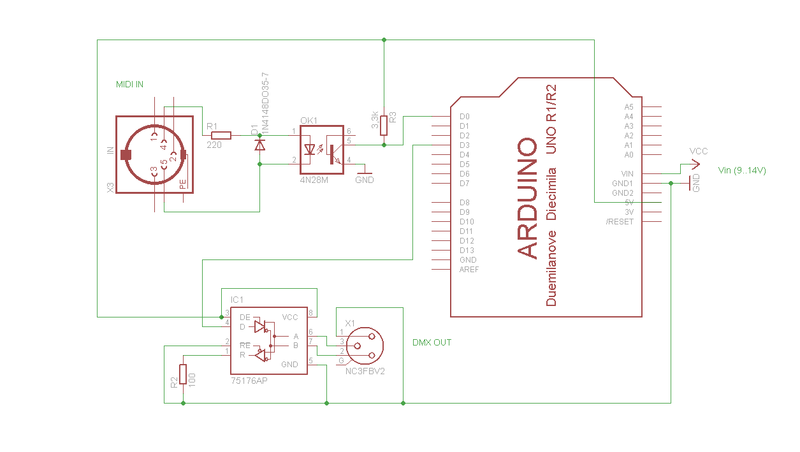 First you can check if the MIDI-In circuit works with this little program I have written. It simply lights the status LED 13 when Midi data is coming in. When it doesn’t, you better check your input circuit or your midi device. Next you can check the DMX output stage with the “Fade” sketch that came with your DMX Library. Play around with the DMX.write() commands until you see something. Did you check the DMX settings of your device? Normally they can be set to “manual”, “DMX” or “Auto” Mode with little switches. The DMX starting address is also set here. Be sure to consult the manual to do it right. This circuit doesn’t provide isolation, so be sure to connect all devices, and the control to ONLY ONE ELECTRIC LOOP (Phase). If you don’t, you can possible blow your equipment. From the depths of our harddisks we like to present: Science Fiction Children & Moritz Simon Geist live at Media Arts Festival CYNETART Dresden Nov. 2012 performing “Caesars Bicycle”. The berlin based robots from Compressorhead are dedicated to rock and roll – and robots. With their three robots (Guitar, Drums, Bass) they have a reportoir constisting of Ramone and Motörhead Song and thelike. Super well crafted and pneumatic.